Copyright AriauAmazonTowers.com. All rights reserved. The Majestic Big Leaf Mahogany – Is it on the Verge of Extinction? The species, Swietenia Macrophylla, or Big Leaf Mahogany is found in the rainforests of southern Mexico, South America, Brazil, and Bolivia. 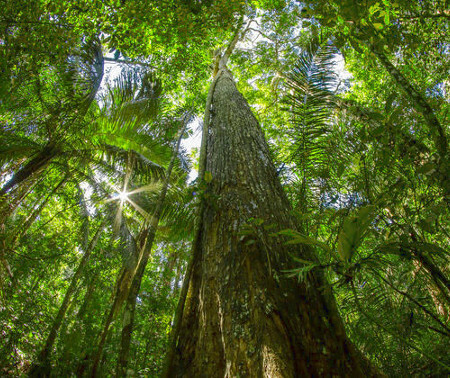 This beautiful tree takes 100 years to mature and stands up to 150 feet, taller than most of the other trees in the rainforest. Because it helps protect smaller trees and plants by providing a shelter over them, the felling of these trees is causing losses in other types of vegetation as well. A major problem for the Big Leaf Mahogany tree is that the legally obtained trees are always the best in the forest-mature ones which contain the seeds necessary for the continuation of the species. No seeds are left for re-growth, and the younger, and now more exposed trees do not have the proper light and protection. Due to the beautiful grains and color in mahogany, the wood has been used for years in building fine furniture, cabinets, and musical instruments. The Big Leaf Mahogany in particular has been used commercially so extensively that it has now been put on the endangered species list. Big Leaf Mahogany has replaced two other now commercially extent varieties of mahogany (Caribbean and Honduras mahogany) and seems destined to follow their path since little has been done to curb the exploitation of this magnificent tree. There is little incentive to do so since it leads all other commercial timber in Latin America. The problem is that it is being logged in places such as parks and private farms, where it is illegal to do so, and then being traded illegally across borders. What is or has to be done to prevent commercial extinction? Since the Big Leaf Mahogany has just recently been put on the endangered species list, the fight to keep it from going extinct has just begun. There have been regulations devised to hinder illegal logging of the Big Leaf Mahogany. Unfortunately, the regulations are barely enforced in some countries. Some countries have voluntarily placed export quotas on the wood to curb illegal trading. Some countries have established a minimum diameter for cutting. An international standard needs to be put in place to prevent illegal trading and selling of this beautiful tree across borders. Currently, it is difficult to determine if any certain kind of mahogany item is obtained illegally. What can be done to protect this endangered species? Even if the Big Leaf Mahogany is soon to be extinct from commercial use, the species itself can be spared. Enforcing laws that prevent logging in parks and private farms is essential. We can help individually by not buying anything made of mahogany that is not stamped with a trademark from a certified forest. The Forest Stewardship Council trademark is a good indication that what we are buying has not been made illegally. Timber may be a good investment. There are companies who invest in rare tree populations that are grown on plantations and farms. We can buy shares in these companies and help to promote the legal logging activities of these beautiful trees. Can Ecotourism Claim To Conserve Local Culture And Traditions? Tourists are sold ecotourism on the basis that it helps to conserve the environment and local culture and knowledge. They are sold it both by the operators, and by themselves. One of the things argued to be conserved are the humans that live in the environment visited: that is culture and traditions, knowledge, and even the genes. However, whether this is a good thing or not is very subjective. Ecotourism businesses by definition require pristine environments to which to take tourists. As soon as the client experience becomes too close to other non-ecotourism holidays, the unique selling point disappears and competition with other types of tour operator sets in. It is in the interests of ecotourism operators to give the appearance of an experience of an unchanged culture. That isn’t necessarily the same as giving the experience of an unchanged environment. We all hope it would be, but it cannot always be. This is particularly the case when the subject of the tourism is people. People have always migrated. That is how there are indigenous people in the Amazon rainforest. There was a time when there were no people, then people arrived. Indigenous is only a relative term compared to our own experience of modern-world cultures. The reason for migration was a search for a better life – more food, less competition. It is logical that if inhabitants of the Amazon basin believe that a better life exists in the cities, they will migrate. That is what has happened. In the process, knowledge that is no longer useful in the new environment is forgotten (or rather, not passed down), and the gene pool is diversified (which is beneficial for any species). It is an argument for ecotourism that such businesses bring in money to local communities, and therefore provide a comparably beneficial lifestyle in situ, mitigating the desire to migrate, and preserving how things have been for a long time. However, tourists shouldn’t expect that any other person shouldn’t change, and shouldn’t adopt new technology. Tourists are often disappointed to see locals dressed in modern clothes using a smartphone because it destroys the experience that they seek (and often that they have paid for). However, use other technologies such as medicine, and most tourists would not deny the benefits or the use. At what point does anyone have the right to judge that another person should be using any particular technology? There are more charges of exploitation of indigenous people by ecotourism businesses and tourists. It is hard for anyone in one society to judge the value of a good to people in another society. A reporter interviewed villagers in the Amazon basin who provided shows of traditional dances to tourists who visited. The tourists were supposedly reluctant to pay for the show and the villagers grumbled that the greedy tourists were exploiting them. The economic question is whether the villagers should continue to put on shows that are not demanded at the price willing to be paid. If the dances, as claimed, are a means of preserving culture, who should pay for them if the tourists do not value them highly? There was a report of a bed-ridden man dying of polio being a tourist attraction. Tourists wanted to photograph him, but were unwilling to pay him for food or medicine. Again, there is a value mismatch that is not sustainable in the long term. This is an example of where ecotourism is not as sustainable as it is promoted. On the other side of the argument, such tourism is at least preserving culture and tradition for longer than it might otherwise be preserved. That might give enough time to document it so that it is not lost. It does keep people (and indeed bring them back) to areas that are close to the state in which they have been for many years, the effect of which is a strengthening of the argument not to change the landscape (claim to rights to develop land are more likely not to be contested if there are no other people claiming rights not to develop it).